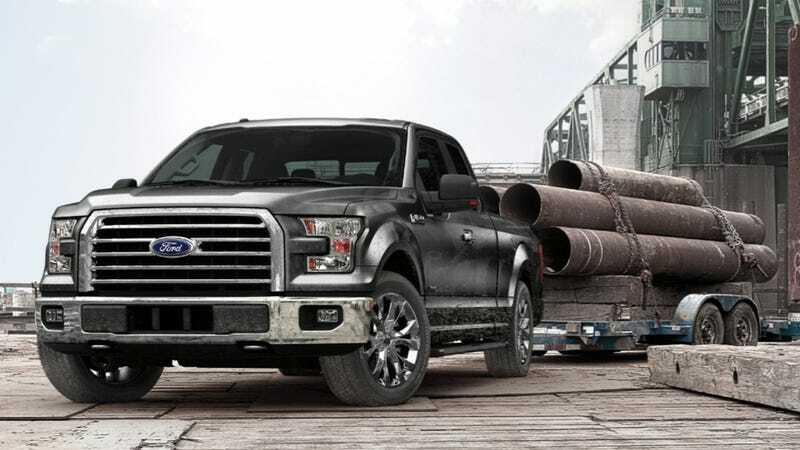 The 2015 Ford F-150's maximum towing capacity has been announced at a massive 12,200 pounds, while payload (what it can hold in the bed) is an even more staggering 3,300 pounds. It's a hell of an evolution for the "half-ton" truck segment, which used to stand for a 1,000-lb payload rating. The new F-150's maximums will undoubtedly be achieved with the V8 and probably 2WD for the tow rating. I'm still having trouble imagining a truck carrying 3,300 pounds in the bed, but believe it or not the 2014 F-150, in regular cab 2WD trim with the 3.5 EcoBoost, is already up to 3,100 pounds payload. The V8 gets an extra 20 pounds on top of that. Both require a "heavy duty payload package." A 2015 Chevy Silverado 1500 with a 6.2 V8 and "Max Trailering Package" is close behind with a 12,000 pound tow rating. The Chevy's payload rating is about 1,700 pounds in that configuration, maxing at 1,820 with a 5.3 V8 in 4WD. A 2015 Ram 1500 with a 5.7 HEMI tops out at 9,250 pounds towing or 1,635 pounds payload. Ford is keeping quiet on fuel economy improvements, cryptically saying the 2015 truck will get "at least 5 percent and as much as 20 percent higher gas mileage than today's truck, depending on the model." There are too many configurations to make an accurate guess.